The Accidental Remodel Part 1 It Begins! Well, it's been quite a while since I've posted here. It warms my heart to see so many of you still stopping by! BIG HUGS! 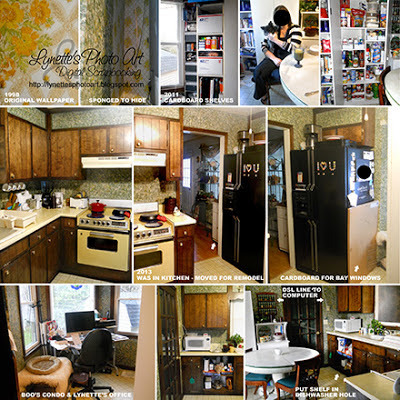 I'm here to invite you to join me on our adventure - The Accidental Remodel! It will be in installments to keep the posts shorter. Don't you just love before and afters? I sure do! I hope you'll come with us! If you read the last couple of posts, you know I was going stir crazy from a year of illness and recovery. I was longing live again, to DO something, to freshen up the surroundings I'd been looking at endlessly. My DIY muscle was sooooo frustrated and longing to STRETCH! Then a little later we started The Accidental Remodel! For any of this to have proper weight, you need to know some things. When we bought this house fifteen years ago, it was foreclosed, vacant and vandalized. There was no water, no heat, no air, no bathroom (rotted to the floor joists, no tub or sink), etc. They'd taken everything from lights, light switch plates, outlet covers, window locks, rods and shelves in closets, everything. I was just a year after a terrible divorce after 20 yrs. of marriage (no, not my idea). All this dropped the price so that, with God's help, we were able to get out of the apartment (where police were always being called) and back into a house. My girls and I moved in here on Mother's Day, fifteen years ago. I remember they had hidden pink peonie plants in their closets and gave them to me that day as we moved in. They just finished blooming this week! How I love those peonies! My paternal grandmother also grew them when I was growing up. Now more sweet memories. So, we were penniless and trying to learn to live this new life, and in a house just short of being condemned. It even had termites! Every day after work I'd go to Lowe's or Home Depot, tell them what was wrong, take notes of what needed to be done and how and they'd fill my cart. Then the next day, back I'd go...it didn't work, tell me again, and we'd go over it again until I succeeded, with God's help and the man who I ended up marrying. There are some things you should know about was the kitchen (cause that's where we're headed). It had original wallpaper from it's construction eons ago, with tons of wrinkles in it, a horrid stove that never worked right, a dead dish washer and a ruined counter. There were so many things we had to do to make the house livable, that I prioritized jobs. I couldn't get the wallpaper off, so I sponge painted three colors on the walls with a 1" sponge to try to camouflage the wrinkles. It did help. The counter was horrid, and the sink. We saw an old sink w/faucet alongside a road and paid the homeowner $25 for it. Ok that was better. I did a lot of steps to the laminate counter that you can read about under "Money Saving Tips" in the label cloud, and after 3 coats of paint and layers of sealant, I had a surface. It had lots of limitations on it's use, but we did it all these years. The last two years it has chipped and become quite ugly. I hauled the dishwasher out and built shelves in the opening to make it useful. It started out with the round table in the bay window where we had breakfast. Over time, due to termites taking over the converted (un-heated, un-cooled) garage where I had my office, it moved to the bay window. That crowded things terribly. Then as supplies and resources for teaching Bible Class grew, it became downright horrible. You can read about the cardboard storage towers I built for class and "The Saga Of The Traveling Table". Wherever you needed to go in the kitchen, you had to move the table. It was indeed challenging for years. LOL it's like a 12 Step Program...realized I was powerless over my kitchen and that my kitchen had become un-managable!!! Here's the "before"s. It actually looks much better in these pictures, which were years ago. Since I know no one has time to read long posts, I'm going to break this up into parts, so please join me for the next part of this crazy story!